As many schools and districts are proving with their wallets, Chromebooks can be an enticing device for the classroom. And why not? They offer the promise of easy management and cloud-based learning in a cost-effective, affordable device. What’s not to love?! Educational website accessibility. Since ChromeOS supports Flash websites (in addition to HTML, including HTML5), Chromebooks are able to access and use many more online educational sites and services than iPads or Android tablets can (technically, Flash still works on Android, but getting it installed is another story…) For example, Chromebooks can access sites like History.org (Colonial Williamsburg), Pixton and GoAnimate animation and comic creation tools, and all of the resources at PBSKids.org (like Sesame Street, Curious George, Wild Kratts, Sid the Science Kid, Clifford, etc. ), as well as games and activities like those found at Scholastic. These educational resources can be accessed easily via Mac or Windows devices, but not via iPads. Not all Chromebooks are created equal. There are a variety of manufacturers, brands, and models. The only thing you can be sure that one Chromebook has in common with another Chromebook is that they both run on Google’s operating system, Chrome OS.This is important to keep in mind, because some Chromebooks are more powerful than others. Some of them have longer battery life than others. Some are more expensive than others. For that reason, Chromebooks are not always cost-effective! Some are over $500 while other, nearly-identical ones, are $199! So, as you can see, under the right circumstances (long-life, low-cost Chromebooks; high-bandwidth infrastructure; and especially if being used for students over 13 years old), Chromebooks can make a great 1:1 device. But will they allow you to truly go paperless?? As I discussed in my previous post about considerations when choosing a paperless device, the above features are very compelling (if not absolutely necessary.) Not if you simply want to supplement a traditional paper classroom with a 1:1 computing device… but if you want to completely replace the tasks done by paper? Will you want to have a touch-screen and, preferably, a good stylus pen for writing/drawing? Possibly. Probably. Well, this is where things get interesting: Chromebook manufacturers are starting to offer hybrid devices that have touch-screen capability. Not only that, but it’s encouraging that devices such as Acer’s C720P boast all-day battery life and a pricetag under $300! 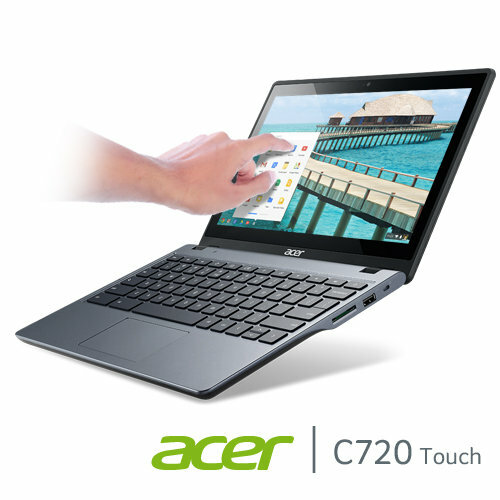 For a Chromebook that has a touch-screen! Touch-screen is still going to suffer from the same limitations as iPads when it comes to writing/drawing; lack of active digitizer means any stylus you get isn’t going to offer fine-tip precision. A touch-screen Chromebook, just like most other touch-screen tablets, isn’t going to be great for handwriting or precision drawing. It costs $100 — or 33% more — just to get that touch screen. When that day comes, then we will truly have an ideal paperless classroom device. This is Matthew Gudenius and I’m here to explain why Cloud Computing is a dirty word. Okay, now that I have your attention… yes, I’m well aware that cloud computing is not actually a dirty word. It’s actually not even one word, it’s two. However, it’s a phrase that’s getting thrown around a lot these days, mostly by companies trying to sell you their cloud computing services. People are starting to automatically assume that cloud computing is a great thing and that we should all be using it, but that’s not necessarily the case. Specifically, I’m going to be addressing the use of cloud computing at institutions with many users, such as schools. Before you can decide whether cloud computing is truly a good solution for you or your institution, you need to understand what cloud computing is and how it works. Cloud computing refers to a variety of services that let you run programs or store your data “in the cloud” – what does it mean to be working “in the cloud”? “The cloud” refers to the cloud bubble symbol that is generally used in visual diagrams to represent the interconnected network of computers and servers that make up the Internet. So when you are “computing in the cloud”, it means that you are manipulating a program or file that is actually being stored or run on a remote server, not your own computer. In essence, you are using your computer like a remote control to get something done on a computer somewhere else in the world. You can access the program or data from anywhere in the world, on many different types of devices. You can easily collaborate with other people from around the world on projects and documents. You free up storage space – you don’t have to use up tons of space on your own device. In some ways, I love cloud computing. I was doing cloud computing 15 years ago, before people were calling it cloud computing. When I needed to easily access my files from any computer, I would log into my Yahoo email account and email the file to myself as an attachment, so I could then get to it from any other computer I might use. I’ve also been storing all of my photos on Flickr for several years now, and I also use Google Docs on a regular basis. In fact, I used Google Docs to plan the script for this video! These are all examples of cloud computing. There can be privacy and security issues. For many purposes, this isn’t a huge concern, but it can be if you are dealing with sensitive data or intellectual capital. I am focused on schools and learning, so generally speaking the built-in security measures of most cloud computing are good enough for me. But they might not be if you are working with sensitive business or government materials. For some users, like school students, cloud computing may not be much of an option because the online services require personal information or email accounts to log in. This often means cloud computing is simply not an option for people who want to protect their privacy, or for people like children whose privacy must be protected according to laws like the Children’s Online Privacy Protection Act. Reason number 3, and this one’s a biggie: probably the biggest limitation of cloud computing is that it can use up far too much internet bandwidth. This stems from how it works. Cloud computing requires high-speed, broadband internet… and, depending on what you are doing, it may require very large chunks of data to be sent. This is especially problematic at institutions where you have many people sharing one internet connection. To understand why, you need to know the basics of how transferring files or accessing websites on the internet works. You can find some great online videos that quickly explain how the internet works in easy-to-understand terms. Some examples are BrainPop’s internet video as well as YouTube videos by WydeaWonders and AaronTitus, so I’m going to borrow some footage from these to explain it to you in very simple terms, which will show why Cloud Computing can be a very bad thing. Whether you’re at home, at an office, or at a school, if you are using the Internet, you are connecting through something called an Internet Service Provider, or ISP. The ISP allows your computer to go out and access other computers by sending and receiving data packets that reach their final destination by hopping from computer to computer on the internet. You can think of it kind of like a big network of roads, and the data being sent out is like little cars driving on those roads. If you want to get something from the internet, like watching a video on YouTube, the YouTube computer has to break that video up into lots and lots of little packets and send them to you. As you receive each one, the video slowly gets built and you can watch more and more of the video. Obviously, the speed at which these packets travel is important. Generally we refer to that speed as bandwidth. You can think of bandwidth like the number of lanes your highway has. The more lanes it has, the more cars can travel simultaneously, so you avoid backups or delays. Now, every Internet Service Provider has a limit as to how much bandwidth you can use. If you have a broadband connection, the FCC defines this as “high-speed Internet access that is always on and faster than the traditional dial-up access. “ But how fast it is and whether you have enough bandwidth to do cloud computing is a little more complicated. Let’s look at an example. If you have broadband internet at home, you might have, let’s say, a connection speed of 6 megabits per second. This would be like having a 6-lane highway where each lane carries 1 megabit of data per second. So, what does this mean? It means you’ve got a whole highway to yourself, so you probably won’t have any problems with things like streaming videos and cloud computing. If you go watch a video on YouTube, that video might be 50 megabytes big, which is equal to about 400 megabits. So, since we can transfer 6 megabits per second, it will take about 67 seconds, or a little over 1 minute, for that entire YouTube video to download and run on your computer. You can watch little segments of it as they arrive, that’s what the loading bar at the bottom of the video tells you… it tells you how many packets you’ve received and how many you’re still waiting for. But what if you live with your family and you are sharing your internet over a wi-fi network? This means maybe you are trying to watch the YouTube video at the same time that your son is downloading a song on his computer. In this case, you have to share the highway with whoever else is using your internet connection. So at that point you only get to use 3 of the lanes for your data packet cars and the other person gets the other 3 lanes to download their song. Once the song or video finishes being sent, those data packets are no longer on the highway and the full bandwidth is cleared up again for the other person’s packets. This might not be much of a problem at home, where you can have a high-speed broadband connection shared by just a few people. But it can be a major problem at a workplace or school, where you might have hundreds of people trying to use the internet at the same time — you will get the same problem as too many cars trying to merge onto a highway with not enough lanes. So let’s look at an average school. A recent internet speed test of K-12 schools in Virginia found that the average download and upload speed was about 20 mbps. So let’s say we have that connection and we only have a few users using the internet. Most likely, there will be no problem, because the highway is wide open, like a 20-lane highway with just a few cars on it. But what happens if you have 100 people using their devices? If those users are working locally — that means they would be running programs on their computer and saving files on their computer or even the local network — it will have no impact on your internet connection. But the problem comes when you start doing cloud computing by working or transferring files through the internet. As an example, let’s say there are suddenly 100 iPads doing a photo project. Since iPads can’t easily access local network folders, and they don’t have USB ports to store the photos on flash drives or external hard drives, you don’t have much of an option — iPads pretty much force you to use cloud computing to send those photos through the internet and store them somewhere you can access, like Dropbox. And it doesn’t matter which cloud storage system you are using — there are many out there, such as iCloud, Dropbox, Google Drive, and Microsoft SkyDrive — but you’re going to run into the same problems with any of them. So if we had 100 people trying to upload or download their photos from Dropbox, suddenly our 20 lane highway doesn’t look so sufficient. So what happens? Well, the photos are broken into little data packets like we show with our cars here, and since there are 100 users but only 20 lanes, the packets have to take turns merging into the flow of traffic. This has completely saturated our 20 lane highway, and the packets still have to queue up and wait their turn to be sent, which slows down the internet connection for everybody. Since photo files on the newest iPads take up about 2 megabytes, this means they require 16 megabits of data to transfer, for each photo. Well, we’ve only got a 20 mbps highway, and we have 100 people trying to use it simultaneously, so each person’s packets have to take turns which means each person can really only transfer their photo at about 2/10ths of a megabit per second. With each person sending or receiving many, many packets, what we get is a traffic jam. Suddenly something that should have taken only 1 second to transfer now takes 80 seconds for every user, or nearly a minute and a half just to access a photo. And while this is going on, it also slows down or prevents other users from accessing websites, watching online videos, or really using the internet for any purpose at all. This whole traffic jam happened because of cloud computing… if we had just saved and transferred the images locally instead of using Dropbox, the internet would still be clear for other purposes like accessing websites. Now, you might think it’s pretty unlikely that 100 users would simultaneously try to transfer a photo to or from Dropbox. And you might be right. But it’s not unlikely that you could have a whole class of 30 students doing such a task at the exact same time. And as we move toward 1:1 computing in schools, it’s going to be very likely that 100 users will be trying to do something on the internet at the same time. As you can see, right now this means that cloud computing simply isn’t feasible if you have 100 or more users trying to use a 20 megabit internet connection. Of course, it also depends on what you’re trying to do. As you can see, transferring full-size digital photos through online storage like Dropbox uses up a lot of internet bandwidth. But transferring music and videos takes up even more. On the other hand, if you‘re simply storing a typed document, or if you’re working on an online document like through Google Docs, then there are not nearly as many packets being sent, and it probably won’t bog down the internet connection. A huge internet bandwidth hog is streaming media. This includes teleconferencing like Skype as well as streaming videos like YouTube, Hulu, Netflix, and Khan Academy, but it also includes streaming music services like last.fm, Pandora, and Spotify. This chart shows the general bandwidth requirements for different online content. As you can see, streaming video requires close to 2 megabits per second — and that’s the minimum, with much higher bandwidth being preferred. And keep in mind, this is the requirement for just ONE device to stream video. These types of services may work for you okay at home, but remember that’s because you are using a broadband connection by yourself or only sharing with a few people. At a school or business, you are sharing that internet with everybody around you, and streaming music and videos are complete bandwidth hogs. The LG website for wi-fi internet capable blu-ray players indicates that you should have a minimum of 1.5 mbps in order to stream video, and that even this speed is going to result in low quality, with preferred speeds of 3 megabits or higher. Obviously, that’s not acceptable for an institution that likely has dozens or even hundreds students and teachers sharing the internet. If just one classroom of 30 students were to use streaming video, it would require more than twice as much bandwidth as the average K-12 school in Virginia has! There is also a new type of cloud computing that poses a particular problem for shared internet connections, and it’s a service called cloud browsing. Cloud browsing refers to services and apps that allow you to access online content and features you wouldn’t normally be able to use. In particular, these apps tend to be designed for iPads, because there are millions of websites iPads can’t access due to use of Flash, Java, Shockwave, Unity, or other web plugins. Since people still want to access these Flash websites, several companies have come out with apps that claim to let you run Flash websites on your iPad. Examples of these apps include Rover, iSwifter, Puffin, SkyFire, and OnLive Desktop. All of these apps work the same way. What they actually do is let you remotely control another computer, and it sends you a non-stop streaming video of what is happening on that computer. This is especially bad for bandwidth because it’s just like streaming a video, except the difference is that the video never ends! If you’re watching a movie on YouTube, that movie has a certain size — maybe 50 megabytes — and once all those packets have transferred to your computer, the streaming stops and you don’t have to worry about hogging the internet anymore. This is not the case with these cloud browsing apps! As long as you keep the app open and running, it sends you a non-stop large video feed to your computer. For example, OnLive Desktop requires about 3 to 5 megabits per second or the video quality starts to suffer. Using these numbers, you can see that if we used one of these programs like OnLive, Rover, or iSwifter at a school with a 20 megabit broadband connection, as few as 4 or 5 iPads running these programs would use up all of the internet bandwidth for your whole school! So, I hope you are starting to see why “Cloud Computing” can be a dirty word. It offers some advantages, but there’s a price to pay, and even though these tasks might work okay for you at home on your personal internet connection, they shouldn’t be used at all at many schools and offices that have to share one internet connection for dozens or hundreds of users. This includes teleconferencing with Skype, streaming videos like YouTube, online file storage like Dropbox, and cloud browsing with apps like Rover or OnLive. In fact, I’m not the only one to point out these cloud computing drawbacks and make these recommendations. The FCC has released a Digital Textbook Playbook of recommendations for schools looking to transition to digital learning environments. This guide book specifically points out that schools should evaluate which content is best served locally and which would be better served from the cloud. Many people nowadays give a definitive answer that going to the cloud is definitely what we should be doing, but the FCC notes the same drawbacks I’ve pointed out in this video… for example, they point out the large amounts of internet bandwidth needed for cloud computing. In this example, the show that if you just had two classes of 30 students using streaming video, it would require at least 30 megabits per second… this is 50% more bandwidth than the average school in Virginia has for the entire school. And that’s just referring to 2 classrooms, or a total of 60 students. What if we wanted to do 1 to 1 digital computing for all the students in the school? Given our current internet speeds and infrastructure, it simply isn’t possible. And that’s what makes Cloud Computing a dirty word — it’s a phrase that’s being thrown around as if it’s something we should automatically adopt… but if you are a school or other large institution and you do this, you are probably going to be facing some dire consequences. So, what can we do? Well, there are several things you can do to work around these problems without having to do live cloud computing and use up all your internet. #1) You can store your files locally. This means you save the file on your computer or device. This means you do not need to worry about internet bandwidth at all, but the limitation is that you can only access the file on that device. If you want to take work home with you, you have to either have your own portable device that you take with you everywhere, or you can store files on a portable storage media like a USB flash drive. #2) Local area networks can serve many of the same functions as cloud computing, letting people store and share files on the network at much faster speeds without impacting internet usage. That school with a 20 megabit limitation on internet transfers can easily have a 1000 megabit — also known as a gigabit — network connection. This means storing and transferring files on your local network would be 50 times faster than using online storage like Dropbox! The drawback is that those files will only be available to students and teachers while they are at the school — not from home or other locations. #3) You can download and save videos and digital content instead of streaming them on demand. By saving them to your computer or your local network, you can reload and play them at any time without using any internet bandwidth. One tool that can help you do this is RealPlayer, which you can download for free at www.real.com.